That’s how Marine Lance Cpl. Howard A. 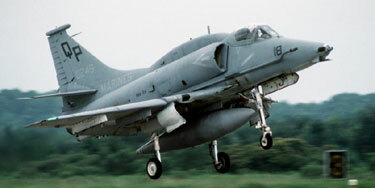 Foot Jr. spent America’s birthday on July 4th, 1986, when the then-21-year-old mechanic clambered into the cockpit of an A-4M Skyhawk at El Toro Marine Corps Air Station and took off on the joyride of his life. Despite never having flown a fighter jet before, Foote managed to pull off a pretty badass flight. ..
Foote was discharged from the Marine Corps, but all charges against him were dropped. This was likely thanks to his close relationship with retired El Toro chief Gen. William A. Bloomer, a mentor of Foote’s who had encouraged him to participate in the gliding challenge that dashed his dreams. And while we’re not exactly sure what Foote is up to now, the Los Angeles Times catch-up with him some 15 months after the incident revealed a man eager to get back in the air. Here’s to you, Foote, for celebrating America’s birthday the way God intended: by fulfilling your dreams, consequences be damned. the Archives of Never Yet Melted in the 'Worth It' Category.